Mixing chocolate and hot pepper together is trendy for a reason: it’s astoundingly delicious. The Red Hot Santa Tini mixes chili pepper infused vodka with Godiva chocolate liqueur, whipping cream and a surprising rim of cocoa and chili powder. This drink is spicy-sweet like a chocolate bar flavored with hot pepper. The sweet and spice enhance each other, even more so than salty-sweet combinations, in my opinion. Of course, for guests who don’t like spice, you can just use regular vodka instead of pepper-infused. Speaking of chili pepper infused vodka, this is an ingredient you’ll need to make ahead of time. You also might want to get a little practice in. The method is simple: put some chili peppers in a bottle of vodka, wait for them to infuse. The trick is figuring out the right level of infusion for your taste buds. I used small red chili peppers – like you see in the picture. After about three days, the vodka will have a fair amount of spicy pepper flavor. If you like it stronger, let it infuse for five days. You can always weaken it by adding some vodka to it (which is a good tip if you’re serving guests with varying levels of spice tolerance). If you like it nuclear, leave it for six to seven days. Don’t save this present for Christmas. Seriously, just call it something else when you’re having it the rest of the year. It’s too good not to be enjoyed year round. Make the chili-infused vodka first: put a handful of Thai chili peppers into a bottle of vodka and let it sit for 3 days. Taste it to test the heat level. If you’re happy, you’re done. If you want it spicier, let it continue to infuse for up to 5 days. If it’s too hot now, take the peppers out, transfer to another container, and add more vodka. Mix some cocoa powder together with a pinch of cayenne pepper, and rim a chilled martini glass with it. Shake the vodka up with the chocolate liqueur and pour the mixture into the glass. 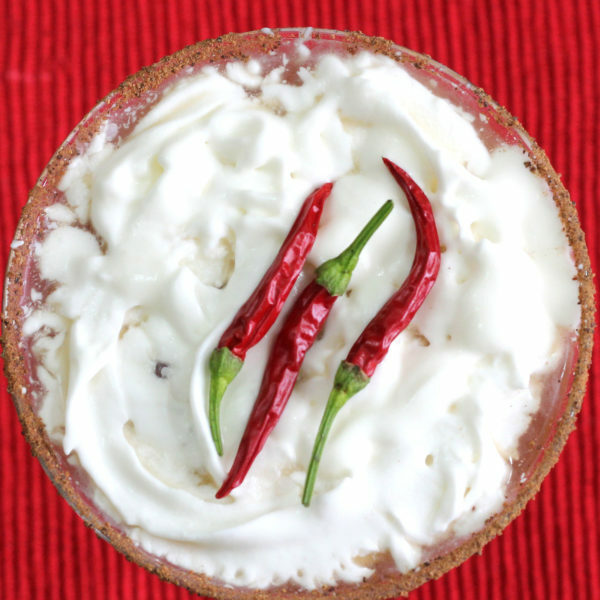 Top it off with the whipping cream and garnish by floating the chili pepper on top of the cream.